At long, long last the PlayStation Store is getting a much needed infusion of Mega Man X love. Capcom have announced that both Mega Man X4 and Mega Man X5 are being released as PSOne Classics in North America this September. Finally. 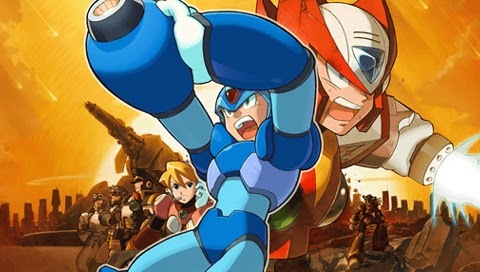 Mega Man X4 is first out the gate on September 2nd (next week! ), with Mega Man X5 in tow on September 9th. You can play these fine entries on PS3 and Vita. I hope this means they've managed to negotiate past the voice actor thing... and also that we'll get the Legends games at some point. I hope not. Redo the voices for the better, I say. PSN Classics can only be as they originally were. They can't make any sort of modifications to the game like adding new VAs or removing them entirely. Then re-release it entirely, OOP I almost forgot, we're dealing with Capcom here. I already have the X Collection, so I would be skipping out on this even if I did own a PS4. If they end up releasing the Legends games, I would download that day one. Yes!!!!! Now bring on MegaMan 8 with VITA support woooooooo! It sure is a shame concerning those silly botched up localized Boss names for 5. But I'm sure a JPN PSN release is right around the corner now. Had 1000 Yen saved up for something else, so this could work nicely as I don't like using my original discs. I'm also forced to use a copy of the game on an old modded PlayStation either way, since my PS3 is USA based. I've already adapter backed up all my saves too for the PS3, so I'm all set and ready to go. The Guns n' Roses names were awesome! Haters gonna hate. I had no problem with them, either. After all, it wouldn't be the first instance of Mega Man characters being named after musical references. I'd rather have what the names were meant to be originally out of some variation, like the previous games in the series. Rather than someone not caring for how the game is being published. These names just don't make any sense and don't fit the characters at all. It's also inconsistent with the previous localized games with this one. Duff McWhalen is the prime example. While Crescent Grizzly is the perfect example of them getting at least one name right out of the 8. There's no reason why they couldn't do a better job with name variation with the others. Maybe they had them based more off the Japanese names like that single one until that Claire voice actor for localized Resident Evil 2 came and ruined everything. Whatever opinion you may have about the names (I disapproved back when X5 came out) it's a part of MM history now. Except now we know why they're that way. And I'm fine with that. It's a cool little fun fact all us fans know and can share with others. Actually his English name is Grizzly Slash, named after Slash from GnR. So happy to be a Wii U owner. Nintendo Virtual Console got the three great Megaman X games. I didn't dislike the PSX games. But I feel no desire to go back and replay them. This is excellent. Mega Man X4 is fantastic, probably better than X2 and X3. I found X4 to be too easy (and I mean easy) and simple, problems I found rectified in X5. I also found I like the soundtrack of X5 more than X4 as well. I like the presentation of X4 (outside of the English voice acting) a lot tho, maybe even more than X5, but X5's MM3 weapon get remix intro does make it a mean fight. I was blown away the first time I saw that. The problem with X5's difficulty curve is all the difficulty revolves around sitting and waiting on everything, and not just Alia. Sitting and waiting on a slow submarine mini-boss that takes up half of Duff McWhalen's stage, sitting and waiting on instant kill lava coming in intervals in Mattrex's, sitting and waiting on an obnoxiously long platform ride in Dark Dizzy's, so much sitting and waiting. X4 is easy but you control the pace of the entire game, just like the SNES games. Yeah, if I had to knock one thing about X5, it would be the pacing. Here's the thing tho, I would also knock X4 for the same thing, except for the opposite effect. Outside of the sometimes obnoxious dialogue (which both games share) at times, and loading screens, X4 for me was just through too quickly. Sometimes I can 100% X4 so quickly (excluding dialog and loading) that I feel unrewarded, in terms of gameplay content. The thing that makes up for this is the X\Zero dynamic, but to me that felt more like a gimmick, or a means of making it feel like the game is offering more than it has. What I felt made X5 a more challenging\fulfilling game is two things bind together. For one it had more to explore in its stages, and made that an obvious point (albeit thro Alia dialog but yeah), and the enemies had more bite to them, and I felt were laid out better (I always play on highest difficulty). I also felt the exploration was rewarding and not mindless or lazily done, and that I liked collecting X-Armor pieces or character parts in that game, or figuring the best way of going about doing that. With X4 it's like, a capsule for Ultimate-X, meh I'll pass, game is easy enough. With X5 it's like, a completion for Gaea-X, great now I can get to that other area that was unavailable before. They had more utility basically.